A Canadian in Cuba: Viñales!! Kat, Kat's mother and brother, Sue and Chris, and I spent the past weekend in Viñales. Easily one of the most beautiful places I have visited in Cuba, Viñales is a small town west of Havana in the province of Pinar del Río. I would have to recommend this town to geology lovers in particular. While my knowledge of geology is limited, I can tell you that the beautiful mountains in Viñales are called "Limestone Karsts" and can also be found throughout Asia. The woman we were staying with, Mirtha, set us up with one of her friends who took us on a walking tour of the countryside. He led us through farmers' fields, over and under barbed wire fences, and all the while we got an excellent view of mountains and tobacco fields. 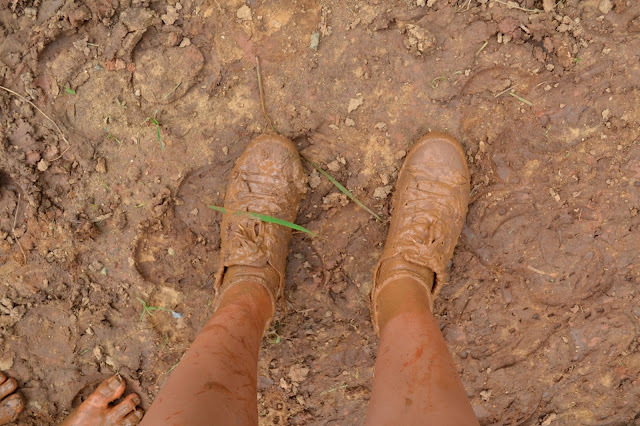 Due to the recent rain, our walk quickly became muddy but once your feet are covered in mud you stop worrying about getting dirty and just enjoy the squishy sensation. We toured tobacco fields and learned a little about the cultivation process. After spending three months growing in the fields, the tobacco leaves are hung in the drying houses for another three months. It's obligatory for the farmers to then sell 90% of their crop to the state and the remaining 10% they cure and roll themselves to sell to the public. To cure the tobacco each farmer combines the leaves with his own particular mixture of water, rum, honey, pineapple, guava and other fruits to add flavor. The way they cure the tobacco diminishes the amount of nicotine in the cigars. The majority of the nicotine in the plant is actually contained within the stems which are not used in the cigars but are instead are used as a natural pesticide. One of the most photogenic farmers, Orestes (who said he was named after Saint Orestes) gave us a quick demonstration of how the cigars are hand rolled. Orestes and his son offered us coconuts filled with coconut water, rum and honey, which we drank together in a small cabin on top of a hill. During our time with Orestes and his son, a storm rolled in and we were happily trapped there for close to an hour. Some farmers from nearby fields came round to take shelter, while one rode off on his horse to get a bottle of rum. He came trotting back shortly and we all shared a couple more drinks before heading back home along the muddy path. I kind of fell in love with this little guy. Orestes - the most photogenic farmer ever. We're back in Havana now and since Kat's birthday was yesterday our Cuban Madre, Lily, has prepared a surprise for dinner! Tomorrow Sue and Chris are headed to the airport early in the morn, and Kat and I go back to work. This week my family is visiting so in all likelihood I won't post again until next week.